The architectural fabric, which met stringent performance requirements, also had proven flame resistance qualities, easily meeting local fire codes. A uniquely custom designed tension fabric structure using Shelter-Rite® architectural fabrics was a major part of a plan to revitalize the appearance of what was described as a "ho hum" retail complex in Edinburgh, Scotland. Comprehensive Design, the project architect in Edinburgh, set out to create an interesting profile to stimulate retail traffic. The concept provided for the aesthetic use of fabric supported with a delicate system of steel beams and cable supports. The ability to provide shelter as well as resist the adverse affects of weather were additional, important considerations. 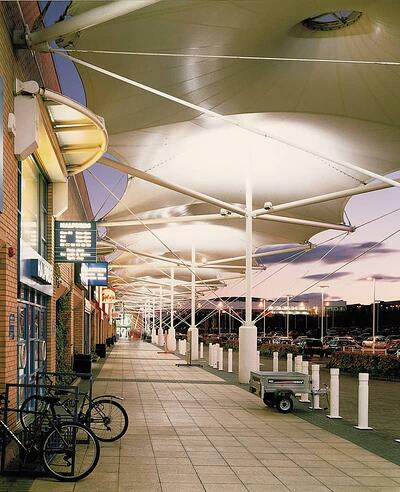 Birdair, working with Comprehensive Design, selected Shelter-Rite Style 9034 FR LTC, DC 184 for the project. The translucent, milky white architectural fabric allows light to filter inside, creating an attractive appearance and reducing the need for artificial light. A fluoropolymer finish on the top side and TS 117 on the other help the fabric resist wear from weather. The finishes also have designed-in self-cleaning features to help maintain an attractive appearance. The architectural fabric, which met stringent performance requirements, also had proven flame resistance qualities, easily meeting local fire codes. Another advantage, the architect said, was Seaman Corporation's extended warranty to back up the fabric's performance. Further, they said the price fit the project budget. As an alternative to conventional building materials, the tension fabric structure proved to offer dramatic advantages in both appearance and cost, with no reported problems since its installation in 1995. In fact, the owners say the architectural structure looks as good as it did when it was first installed.